Nigeria’s Senate President Bukola Saraki and the ruling All Progressives Congress Chairman, John Odigie-Oyegun, were conspicuously absent at the 10th Bola Tinubu Colloquium held Thursday in Lagos. Also absent at the event put in place to mark the 66th birthday of the APC national leader was Speaker of the House of Representatives, Yakubu Dogara. The event, which was attended by President Muhammadu Buhari, held in Victoria Island, Lagos. Aside Mr Buhari, others at the event were Vice President Yemi Osinbajo; business magnates, Aliko Dangote and Jim Ovia; governors, senators, members of the house of representatives, chieftains of the APC, among other notable Nigerians. Themed “Investing in people”, the event had participants discuss the potentials of the welfare programmes and human capital investments of the Nigerian government. 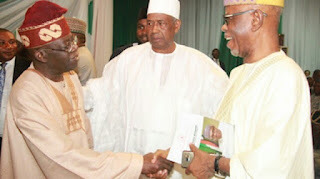 It was not immediately clear why Messrs Odigie-Oyegun, Saraki and Dogara were absent at the event. Mr Odigie-Oyegun is engulfed in a crisis following the rejection of the elongation of tenure granted to the executives of the party by President Muhammadu Buhari earlier in the week. Mr Tinubu had openly disagreed with the tenure elongation and had immediately lauded the president’s rejection of the arrangement. Speaking on Thursday, Mr Tinubu urged Nigerians to reject the apology of the opposition Peoples Democratic Party and support the APC.